Where did you find the CDC deaths from Measles info? I have been trying to find it on their website and can only find cases of measles and no info on the number of deaths from the disease. Thank you very much for this well documented article. I appreciate the references. While most folks find it difficult to read the plethora of information that is available clearly demonstrating there are serious 'adverse reactions' to vaccines, this compendium of MMR information is so important. Why important? Because of the terrible media reports on measles outbreaks that make people think, better go get this vaccine. HORRIFIC AND UNNECCESSARY media hysteria. Frankly after seeing my own child suffer through an adverse reaction, I am glad I have kept my attennae up to research this important health subject. I just hope others will too. Again, thank you so very much for this well written article! Everyone who is genuinely interested in what those who demand vaccine science be made public should read and watch the 9-hour video deposition & red the pdf of the video of Dr. Stanley Plotkin.In this deposition he revels under the penalty of perjury information that independent scientist and researchers plus parents who are concerned about their children have known for decades. 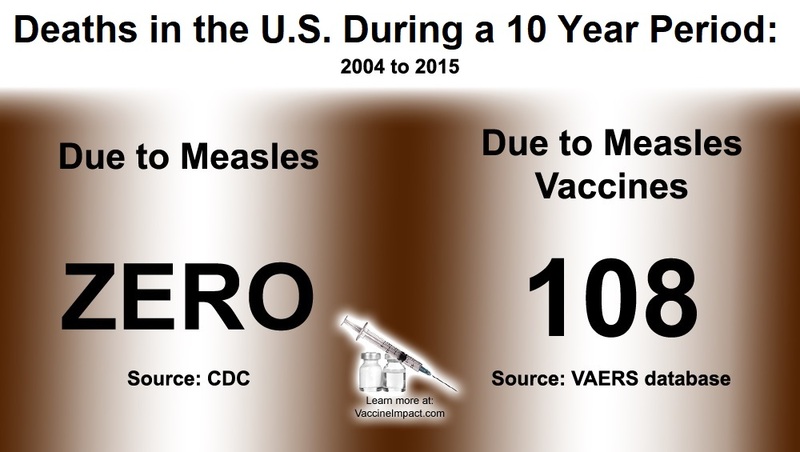 That here has only been 1 vaccine studied and it was the measles and it was not studied using the Gold standard of Research that every other drug is subjected to. Dr. Stanley Plotkin, world renowned Vaccine Scientist who frames the message for the media to give to the public.Who is known as the Godfather of Vaccines and has written what Bill Gates call the Vaccine Bible: Vaccines- in a 2013 poll was named one of the top 50 “most influential people in vaccines,” Dr. Plotkin was voted number two, behind only Bill Gates, volunteered to be an EXPERT witness in a Michigan Custody Case in 2018.He was deposed by Aaron Siri in New Hope, Pennsylvania on January 11, 2018. The entire unedited 9-hour deposition is on youtube under Stanley Plotkin Deposition - Full Audio/Video). PDF: https://www.docdroid.net/8zJh4QQ/1-11-18-matheson-plotkin.pdf#page=174.Plotkin’s is Vaccines. Everything you read in the media-he has framed for the public.After Plotkins deposition of January 11, 2018 the very next morning, January 12, 2018, Dr. Stanley Plotkin withdrew from testifying as an expert witness on vaccines. Under the penalty of perjury Plotkin’s was compelled to admit that there are NO Double Blind placebo controlled studies on any vaccine.Go to youtube, put in Plotkin’s deposition & Coming Clean About Vaccine Safety.He says they do not follow the Randomized double-blind placebo control studies which is the “Gold Standard” of scientific research and testing.He says it would be ideal, but it’s not done.Vaccines that are tested after they have been given to children are tested against other adjuvants (no placebo or control group) at some point but Plotkin’s couldn’t say when.He did have his book with him and referenced telling the attorney to look things up. Plotkins admits that there are NO safety or efficiency studies done on any vaccine prior to licensing and administering to children.Ex: He states there was no safety testing PER-LICENSING FOR THE HEP B. He also revealed in his deposition that Hep B is studied for only 5 days after children are injected and there is no placebo control group.There is no Randomized Double-Blind Placebo control studies done. He states again it would be ideal, but it's not done. Mr. Siri read off the list of adverse effects on the Hep B manufactures insert and asked if any of the affects can be determined in 5 days-Plotkins’s stated -No. Siri asked Plotkin specifically was there a control group for any study on the Hep B, Plotkins replied-NO. Plotkins was questioned about the MMRII and why was there no study information on the manufactures inset which is mandated.Plotkin’s at first said there was but was shown there wasn’t.He then said there were test done because he was there, but he couldn’t remember any of it. Than he said it was the FDA’s responsibility to put that info on the insert.Mr. Siri than said the MMR wasn’t test because it was Grandfathered in and Plotkin’s sputtered and no, there is testing basically somewhere. In the deposition pages 169-177 Plotkins admitted the MMR was not subjected to a randomized, placebo-controlled study that involved a placebo or a control group. Testing was not done per-licensing. The written deposition is 403 pages but well worth the time spent to read it.You can read along with the youtube video. https://www.youtube.com/watch?v=nXTaJjfGNAI&t=1136s. Plotkins reveals things that have been long hidden from the public which is why he withdrew his expertise.In court under the penalty of perjury he would either say he lied in his deposition or when asked the same questions in court he either have to lie or repeat what he said.